Wales received another boost after British and Irish Lions full-back Leigh Halfpenny made a successful return to action for Scarlets. Less than 24 hours after Wales beat England, Halfpenny played for the first time in more than three months after suffering concussion. He kicked four conversions and a penalty as his side defeated Cheetahs in the Pro14 with six tries. The 30-year-old lasted the game despite suffering an early knock. Uzair Cassiem, Johnny McNicholl, Kieron Fonotia, Josh Macleod, Wyn Jones and Paul Asquith scored tries. The bonus point victory allowed the Scarlets to reduce the gap in Conference B between them and the top three. Scarlets remain fifth, but are now only three points behind third-placed Ulster who occupy the final play-off spot. 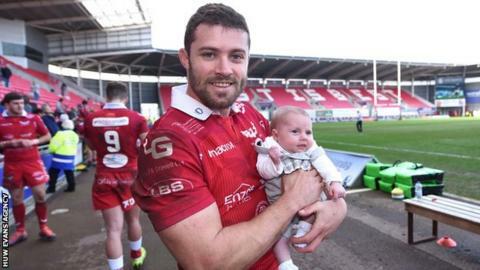 But while Scarlets eyes were focused on their Pro14 progress, Halfpenny's return was eagerly anticipated by Wales fans. After beating England 21-13 on Saturday, they are the only unbeaten team in the tournament and wins against Scotland and Ireland would earn a Grand Slam. Halfpenny had suffered several setbacks in his attempts to return sooner, after initially picking up the injury against Australia on 10 November. He was injured in a challenge by Wallabies centre Samu Kerevi, which was unpunished but described by Wales head coach Warren Gatland as "reckless". The head blow led to Halfpenny missing Wales' autumn wins against Tonga and South Africa as well as their Six Nations victories against France, Italy and England. Wales also released Jake Ball, prop Wyn Jones and Ryan Elias who all started, while Rhys Patchell came off the bench. Ball captained the Scarlets. Cheetahs were without centre Nico Lee, who began his 13-week ban for "clearing the contents of his nose on to the face of an opposing player" against Connacht. Halfpenny started the move which led to the opening try as he counter-attacked after 90 seconds, with breaks from Paul Asquith and McNicholl leading to a try from former Cheetah Cassiem. Halfpenny needed treatment after the try with Dan Jones taking the conversion, but the full-back stayed on. Scarlets soon followed up with another try for McNicholl, with Halfpenny converting to the roar of the crowd before a clever grubber kick from fly-half Jones was collected by Fonotia for Scarlets' third try. The bonus point try came inside 20 minutes after a break from scrum-half Kieran Hardy was finished off by Josh Macleod. Halfpenny again converted. After McNicholl was yellow-carded for a professional foul, Cheetahs centre Benhard Janse van Rensburg crashed over and Tian Schoeman converted. Halfpenny stole a ball from a Cheetahs ruck just before half-time and sprinted up the right touchline before being hauled down. Cheetahs scored a spectacular runaway try just before the interval after wing Rabz Maxwane latched on to a kick, reducing the half-time deficit to 28-14. Halfpenny's resolve was tested early in the second half and he stood up to the challenge with a crunching tackle on William Small-Smith. This provided the foundations for Scarlets' fifth try, eventually scored by Wyn Jones before Patchell was introduced for Dan Jones in the 47th minute. Schoeman cleverly created the third Cheetahs try for number eight Gerhard Olivier before Halfpenny slotted over a penalty. Following a lull, Scarlets crossed for their sixth try after McNicholl's interception try set up a score for Asquith. Halfpenny's conversion attempt rebounded off an upright. Scarlets coach Wayne Pivac said: "Leigh took a little bump early on and it was great to see him play through that. He will be much the better for playing 80 minutes. "It has been frustrating but we will put it behind us and he had a very tidy game for someone who has been out for that length of time." Scarlets: Leigh Halfpenny; Johnny McNicholl, Kieron Fonotia, Paul Asquith, Ioan Nicholas; Dan Jones, Kieran Hardy; Wyn Jones, Ryan Elias, Werner Kruger, Jake Ball, Josh Helps, Josh Macleod, Dan Davis, Uzair Cassiem. Replacements: Marc Jones, Dylan Evans, Javan Sebastian, Lewis Rawlins, Tom Phillips, Sam Hidalgo-Clyne, Rhys Patchell, Steff Hughes. Cheetahs: Louis Fouche; William Small-Smith, Benhard Janse van Rensburg, Dries Swanepoel, Rabz Maxwane ;Tian Schoeman, Shaun Venter (Captain); Ox Nche, Marnus van der Merwe, Aranos Coetzee, Walt Steenkamp, JP du Preez, Abongile Nonkontwana, Junior Pokomela, Gerhard Olivier. Replacements: Jacques du Toit, Reinach Venter, Luan de Bruin, Sintu Manjezi, Jasper Wiese, Henco Venter, Rudy Paige, Tian Meyer.